Not able to come? How about supporting the camp through a donation! 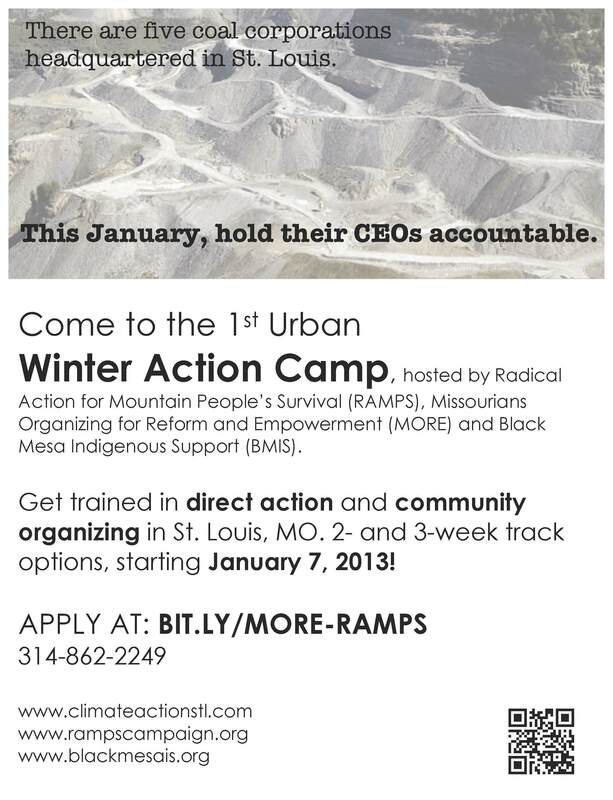 As we are having this camp in St.Louis, folks from both Black Mesa and West Virginia will have travel expenses. Please donate to help send impacted community members to the Headquarters of the companies who are destroying their health, water and way of life! Trainings will include: community organizing basics, one on ones, how to form an organizing committee, meeting agendas, knock on doors, house meetings, direct action, campaign strategy, scouting, exhausting administrative remedies, action medic, corporate research, consensus decision making, NVDA, importance of the debrief, de-escalation, facilitation, false solutions to climate change, security culture, action planning, action communication, health and safety, mtr – 201, anti-oppression, ramps, more, bmis, extraction and indigenous folks, anti-racist//decolonial, patriot-arch-peabody, cultural sensitivity, anti-racism and decolonial allyship, From the Hollers to the Hoods, outreach 101, fundraising 101, organize a demo, staying in it for the long haul, peacekeeping, true cost of coal – beehive, community building, non-hierarchical organizing, campaign research, information gathering, have a conversation with other grassroots and community leaders, Digital security, intro to longwall mining, Theory of Relativity, anti-extraction movement building, solidarity, prison industrial complex, blockades, using your body, using lockboxes, structures, extraction, constructing tootsie rolls, creating urban lockdown points, sleeping dragons, climbing, adv. structure rigging, climbing physics, setting climbing anchors, pole climbing, building and raising a platform, deploying large occupied banners, constructing a rebelay, basic rescue techniques, aid climbing horizontally on a structure, legal research, speaking legal-eeze, slapp suits, intro to fake paralegal work, strategic legal defense, legal observation, police liaison, jail support, know your rights, media basics, day of action media, social media, press releases, media teams, media prep work, narrative storytelling, listening projects, spokespersons,street medic, … and others … The direct action track will be separated into tracks with intensive trainings in focus areas. The camp will feature a 2-week (Jan 7-20) and 3-week (Jan 7-27) option. There will be two featured tracks, direct action and community organizing, with significant overlap and emphasis put on how these fundamental aspects of resistance fit together. Both tracks will include multiple actions targeting extractive industries and provide a solid set of skills that can be used in any campaign. Both tracks are a full-time commitment and will include intensive training and hands-on experience. Apply here today, space is limited! Participating in this camp is a full-time commitment for either 2 or 3 weeks. We expect individuals to come wanting to work hard and to stay the entire time. There will be a sliding-scale fee to cover housing and food, but we will not turn anyone away for lack of funds. All must be comfortable in a communal living environment of 40+ people. We will not tolerate harassment of any kind. There is limited space, so apply early! Apply here today, space is limited!